Copyrights: ©2015 Nawayon J, Sirisomboon P. This is an open-access article distributed under the terms of the Creative Commons Attribution License, which permits unrestricted use, distribution, and reproduction in any medium, provided the original author and source are credited. Orange juices are a popular refreshment beverage and nutrition source. However, the adulteration of pure juice has now become a common practice. In this study, near infrared spectroscopy was applied as a means to determine whether different orange juice samples had been adulterated with sugar solution or not. For this purpose, 10 samples of 100% fresh juice and80 samples with different concentrations of sugar solutionswere created in a laboratory setting. Each sample was scanned with an FT-NIR spectrometer. 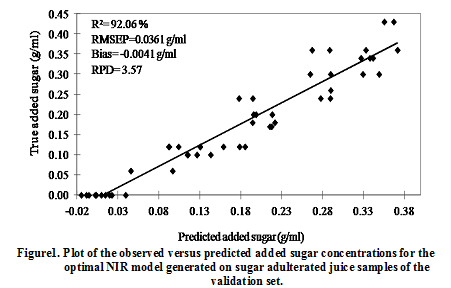 A PLS regression model tested by validation set to predict the sugar-added content of juice samples provided R2, RMSEP and a bias of 92.06%, 0.0361 g/ml, and -0.0041 g/ml, respectively and for water-added 87.68%, 7.37%, and -1.26%, respectively. 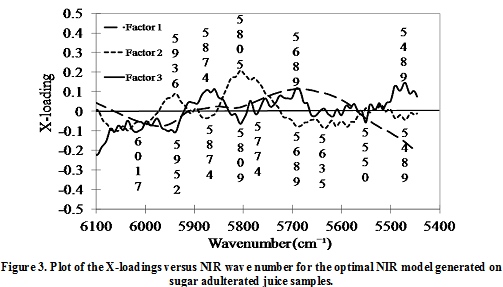 These results confirm that an NIR-based protocol could be applied for sugar adulteration in orange juice. Orange juice; Adulteration; Sugar solution; Near infrared spectroscopy; PLS regression. Due to increasing temperatures and the desire for healthier diets, cool fruit juices have become popular particularly in Bangkok and near-by provinces. Orange juice is rich in phenolic compounds and ascorbic acid .Because of its phenolic content, orange juice has known antioxidant properties .In addition, significant amounts of L-ascorbic acid or vitamin C is contained in oranges, making them an important source of nutrition. Indeed, the nutrition content found of oranges is commonly used as a nutritional index. Due to the size and value of the commercial fruit juice market, the adulteration of the product has been widely practiced, especially in locations along busy roads and intersections in Thailand.Orange juice vendors are found scattered throughout Bangkok and near-by Provinces. It is a widely held belief that adulteration of the orange juice by the addition of sugar solution is a common practice. Therefore the ability to detect for the adulteration of orange juice with sugar solution is clearly needed to protect consumers. Near infrared spectroscopy (NIR) is a non-destructive technique that can be used to rapidly evaluate chemical constituents of materials. Rodriguez-Saona et al. developed an FT-NIR model to predict the sugar levels in fruit juices (apple and orange from department stores) and compared it with HPLC and standard enzymatic techniques. The models generated from transmittance spectra gave the best performance with a standard error of prediction (SEP) < 0.10% and an R2 of 99.9%, with the ability to accurately and precisely predict the sugar levels in juices. Hong and Wang  studied the authentication of fresh cherry tomato juices adulterated with different levels of overripe tomato juices: 0 – 30%. Their study indicated that the prediction performances by fusion approaches were better than by the sole usage of an e-nose or e-tongue method; yet classification and prediction performances based on different fusion approaches vary. Boggia et al. proposed a strategy based on UV-VIS spectroscopy for the detection of filler juices and water added to pomegranate juices. Visible and NIR spectroscopy have also been used to determine the levels of important nutrients in orange juice including citric acid and tartaric acid. The correlation coefficients (r) and root mean squares error of prediction (RMSEP) in the best model were 0.944 and 0.596 for citric acid and 0.930 and 0.013 for tartaric acid . For soluble solids contents (SSC) and pH the correlation coefficients (r),standard error of prediction and RMSEP for SSC were 0.98, 0.68, and 0.73 for SSC and 0.96, 0.06, and 0.06 for pH, respectively . Determination of glucose, fructose, sucrose and citric and malic acids in orange juices were carried out using dry extract samples and the ability of calibration models was acceptable in comparison with the reference methods . The classification accuracy for prochloraz residue was found to be 100% . In addition, 3D-front-face fluorescence spectroscopy has been used to assess the adulteration of orange juice by grapefruit juice at percentages as low as 1% . Principal Component Analysis (PCA) was applied to a set of physicochemical variables and the addition of sugar were investigated. Detecting adulterations started from approximately 15%. The rapid automated screening technique Curie-point pyrolysis mass spectrometry (PyMS) was used to detect a 10% (w/v) beet sucrose solution adulterated with freshly squeezed orange juice over the range 0-20% (or 0-20 g 1-1 of added sucrose) and provided calibration models which gave excellent predictions for sucrose adulteration levels below 1% . The applicability of rapid analytical methods, such as NIR, for fraud detection in fruit juice, and in particular orange juice is of most interest to researchers and government officials. 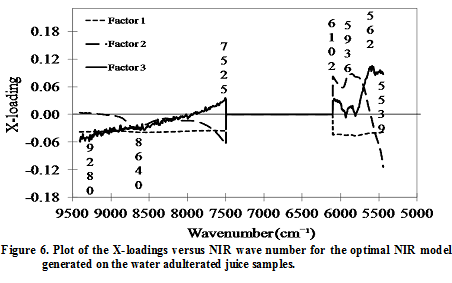 Therefore, the objective of this research was to assess the application FT-NIR spectroscopy for the determination of the adulteration of orange juice with sugar solution at different concentrations. There were 10 samples of 100% fresh juices squeezed from oranges (Citrustangerina) bought from a main agricultural distribution market in Pathumthani Province, Thailand. Citrus tangerina, referred to as “Kiew Wan” in Thailand, is a popular variety used for making juice for sale. Before squeezing, the fruit was cut in half, with 2-3 halves being squeezedat a time without peeling or seed removal.Eighty 200 ml samples of mixed pure juice, sugar solutions and water with different concentrations by volume were prepared (Table 1). There were 5 samples for each level of adulteration.The sugar solution concentration used was 50% w/w. Each sample was transferred into a glass vial of 22 mm diameter and covered with a stainless steel transflection plate. This provided a 2 mm optical path length, Samples were then scanned between 12500-3600 cm-1 with a nominal resolution of 8 cm-1, accumulating 32 scans per spectrum using a background of the gold. The scanning was performed at room temperature(25 ± 1 °C) using a Multi-Purpose Analyzer (MPA- FT-NIR spectrometer, Bruker, Bremen, Germany). 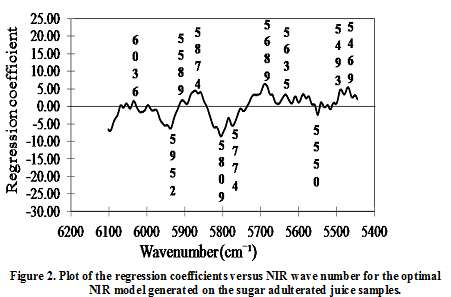 The NIR calibration models for the pure orange juice and adulterated samples were developed for determination of the amount of added sugar and added water using partial least squares regression (PLS).After the reference data and spectral data were merged and run in ascending order of the reference data. The calibration and validation set were randomly selected using OPUS, v.7.0.129 software with the condition that calibration set covered the full measurement range. Therefore, all types of juice, 100% fresh juice and adulterated juice, were in both calibration set and validation set. The calibration set consisted of approximately 70 % with the remainder used as a validation set. OPUS, v.7.0.129 was used in both spectrum pre-treatment and model development. The NIR spectra used for model development were pre-treated using the following methods in the software; no pre-treatment, constant offset elimination, straight line subtraction, vector normalization (SNV), min-max normalization, multiplicative scatter correction (MSC), first derivatives, second derivatives, first derivatives +straight line subtraction, first derivatives +SNV and first derivatives +MSC. The combination of the following wave number ranges including approximately 9000-7500 cm-1 (Region A), 7500-6100 cm-1 (Region B), 6100-5450 cm-1 (Region C), 5450-4600 cm-1 (Region D) and 4600-4250 cm-1 (Region E), and pre-treatment method was used for model development. The number of latent variables (PLS factors) in a calibration model was optimized by minimum root mean square error of cross validation (RMSECV). After that the optimal model was tested by validation set and the coefficient of determination (R2), root mean square error of prediction (RMSEP) and the prediction bias were reported. Table 2 shows the minimum (Min), maximum (Max), mean, and standard deviation (SD) of sugar-added and water-added in fresh orange juice samples in calibration set and validation set. 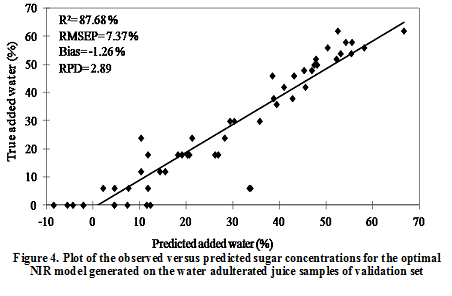 The scatter plot in Figure 1 shows the prediction data and the reference data for the sugar adulterated samples. The best model was developed using the vector normalization (SNV) method in the range of 6102 - 5446.3 cm-1 leading to a coefficient of determination (R2), root mean square error of prediction (RMSEP), a bias and residual predictive deviation (RPD) of 92.06%, 0.0361%, -0.004%and 3.57,respectively. Table 3 shows the prediction statistics associated with the PLS model of the adulterated samples. In addition to a very low error of prediction, the R2 of between 92-96% implies that the model is sufficiently predictive to be used in applications including quality assurance . The RPD is calculated from the ratio between the standard deviation of reference values in the validation set and the standard error of prediction. The RPD of 3.1-4.9 implies that the model is sufficient for screening . Figure 2 shows a plot of the regression coefficients for the model generated on the sugar adulterated samples while Figure 3 shows the corresponding X-loadings. The large regression coefficients and X-loadings indicate molecular vibration bands that are important in defining the PLS model.Table 4 contains data for the large peaks in the regression coefficient plot and X-loading plot and corresponds to important bond vibrations. It was apparent from the initial analysis that vibrations due to water effect were not important whereas those of cellulose and other C-H bonds were important. This appears to be a reflection of the fact that pure, fresh orange juice contains some degree of pulp material. The scatter plot showing the reference data and the prediction data for the water added model is shown in Figure 4. The best model developed using non-pre-treated spectra in the range of 9403.8 - 7498.3 cm-1 led to an R2, RMSEP, a bias and RPD of 87.68%, 7.37%, -1.26% and 2.89, respectively. Table 5 shows the prediction statistics associated with the PLS model built on the water-adulterated orange juice samples. The model displays R2 of between 0.83-0.90 implying that the model is usable with caution for most applications, including research . The RPD of between 2.4-3.0 implies that the model is suitable for rough for screening . Figure 5 shows a plot of the regression coefficients for the water adulterated model while Figure 6 shows a plot of the X-loadings. The absorption bands with large X-loadings and regression coefficients are described in more detail in Table 6. It was again obvious that the water band vibration had no effect on the model, instead being relianton cellulose and other C-H vibration. 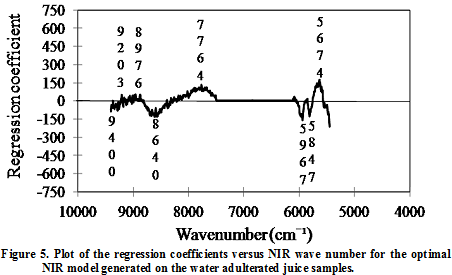 The results obtained in this study suggest that NIR spectroscopy could be used as an alternative method to determine the adulteration of orange juice by sugar and water. The amount of sugar and water added to orange juice can be evaluated using this technique. The predictive statistics suggest these models are suitable for use with caution in most applications. This useful finding suggests the method could be used to guide the decisions by food and drug administrations in terms of product quarantine in order to protect consumers. The authors would like to express their gratitude to the Faculty of Engineering, King Mongkut’s Institute of Technology Ladkrabang for financial support for this research and to the Near Infrared Spectroscopy Research Center for Agricultural Product and Food (www.nirsresearch.com) for providing the instruments. 13. Williams P (2007) Near-infrared technology–Getting the best out of light (5thed.). A short course in the practical implementation of near-infrared spectroscopy for the user. PDK Grain, Nanaimo, Canada: p 5-8. 14. Osborne BG, Fearn T (1986) Near infrared spectroscopy in food analysis (1st published). Longman Science and Technical, UK: p117.